The materialistic demeanor cannot possibly stretch to the transcendental autocrat who is ever inviting the fallen conditioned souls to associate with Him through devotion or eternal serving mood. The phenomenal attractions are often found to tempt sentient beings to enjoy the variegated position which is opposed to undifferenced monism. People are so much apt to indulge in transitory speculations even when they are to educate themselves on a situation beyond their empiric area or experiencing jurisdiction. The esoteric aspect often knocks them to trace out immanence in their outward inspection of transitory and transformable things. This impulse moves them to fix the position of the immanent to an indeterminate impersonal entity, no clue of which could be discerned by moving earth and heaven through their organic senses. The lines of this booklet will surely help such puzzled souls in their march towards the personality of the immanent lying beyond their sensuous gaze of inspection. 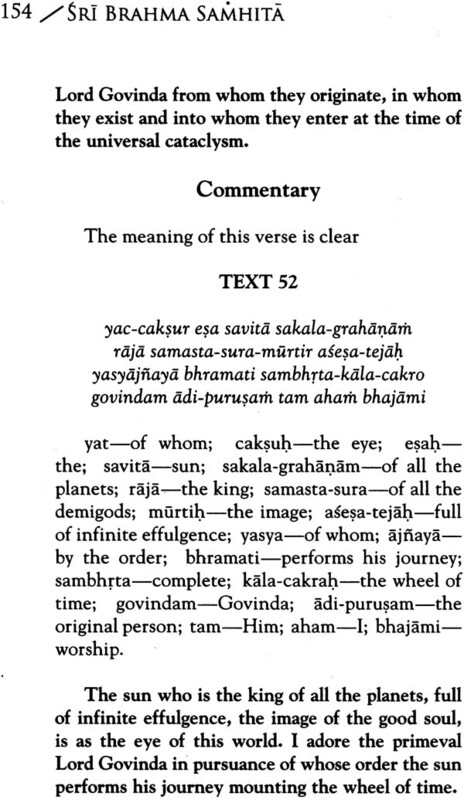 The very first stanza of this publication will revolutionize their reserved ideas when the nomenclature of the Absolute is put before them as “Krsna.” The speculative mind would show a tendency of offering some other attributive name to designate the unknown object. They will prefer to brand Him by their experience as the “creator of this universe,” “the entity beyond phenomena”-far off the reference of any object of nature and void of all transformation. So they will urge that the very fountainhead should have no conceivable designation except to show a direction of the invisible, and inaudible untouchable, non-fragrant and unperceivable object. But they will not desist from contemplating on the object with their poor fund of experience. The interested enquirer will be found to hanker after the records left by erudite savants to incompatible hallucinative views of savage demonstration. In comparing the different names offered by different thoughts of mankind, a particular judge would decide in favor of some nomenclature which will suit best his limited and specific whims. The slave mentality of an individual will no doubt offer invective assertions to the rest who will be appealing to him for a revelation of his decision. To remedy this evil, the hymns of the accepted progenitor of the phenomena would do great help in taking up the question of nomenclature which is possessed of adequate power to dispel all imaginations drawn out of their experiencing the phenomena by their tentative exploitations. The first hymn will establish the supremacy of the Absolute Truth, if His substratum is not shot by the bullets of limited time, ignorance and uncomfortable feeling, as well as by recognizing the same as an effect instead of accepting Him as the prime cause. He will be satisfied to mark that the object of their determination is the par-excellent Supreme Lord Sri Krsna who has eternally embodied Himself in His ever-presence, all-blissful, all-pervasive perfected knowledge as the very fountainhead of all prime causes of unending non-beginning time, the supplying fosterer of all entities, viz., mundane and transcendental. The subsequent lines will go to determine the different aspects of the Absolute, who are but emanations of the supreme fountainhead Krisna, the attractive entity of all entities. 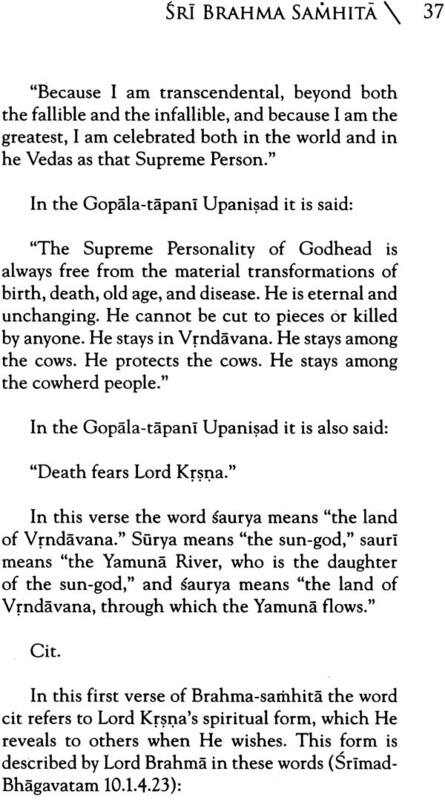 Moreover, the derivative proclamation of the nomenclature will indicate the plane of uninterrupted, unending, transcendental name “Krsna” is known as the embodiment of all the transcendental eternal rasas as well as the origin of all eclipsed conceptions of interrupted rasas found in the mentality of animated beings which are successfully depicted by litterateurs and rhetoricians for our mundane speculation. 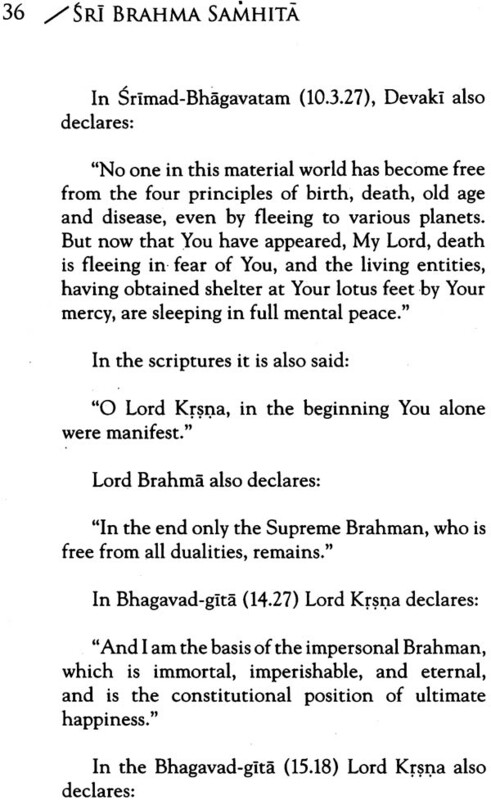 The verses of Brahma-samhita are a full elucidation of the origination of phenomenal and noumenic conceptions. The hymns of the incarnated prime potency has dealt fully with the monotheistic speculations of different schools which are busy to give an outer cover of an esoteric concoction without any reference to the true eternal aspect of transcendental non-transformable and imperishable manifestation of the immanent. The hymns have also dealt with different partial aspects of the personality of the Absolute who is quite isolated from the conception of the enjoyers of this phenomenal world. A very close attention and a comparative study of all prevailing thoughts and conceptions will relieve and enlighten all-be he a materialist, a downright atheist, an agnostic, a skeptic, a naturalist, a pantheist or a panantheist-busy with their knowledge of three dimension only by their speculative exertions. 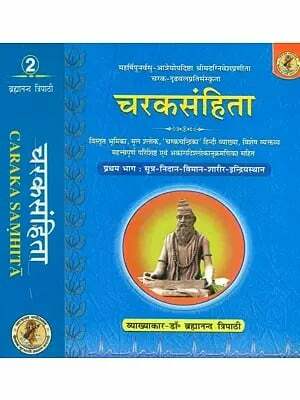 This booklet is only the fifth chapter of the Hymns of Brahma which were recorded in a hundred chapters. The Supreme Lord Sri Caitanya picked up this chapter from the temple of Adi-kesava at Tiruvattar, a village lying under the government of Travancore, for the assurance of all God-loving, and especially Krsna-loving, people in this conditioned jurisdiction. This booklet can easily be compared with another book which passes by the name of Srimad-Bhagavatam. Though it has got a reference in the pantheon of Puranas, the Bhagavatam corroborates the same idea of this Pancaratra. 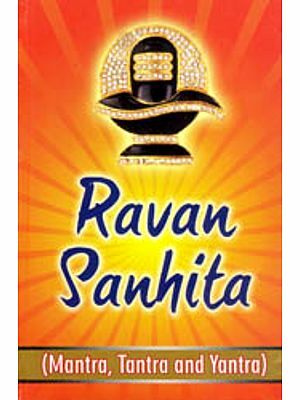 The devotees should consider that these two books tend to the identical Krsna who is the fountainhead of all transcendental and mundane entities and has a manifestive exhibition of the plenary variegatedness. Aspersions of calumniation are restricted in the limited world, whereas transcendence cannot admit such angularities being an angle of 180 degrees or void of any angular discrepancies. The publisher is carried away to the realm of gratitude when his stores of publication are scrutinized. Thakura Bhaktivinoda has given an elucidatory purport of the conception of the most sublime fountainhead of all entities in Bengali, and one of his devout followers has rendered that into English for propagatory purpose. 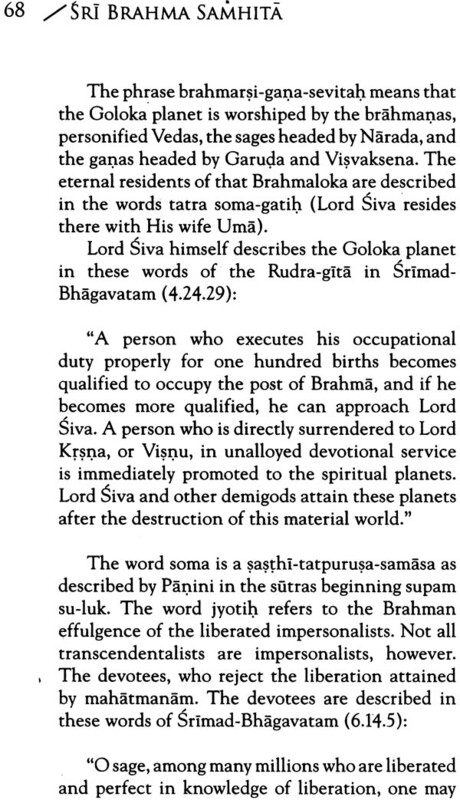 The purports and the translations are traced to the backgrounds of the writings of Srila Jiva Gosvami, a contemporary follower of the Supreme Lord Sri Krsna Caitanya. The Emotional aspirations will find fair play in perusing the texts of this brochure by one and all who have any interest in pure theistic achievements. The materialistic inspection often goes on to say that the provincial conception of theism has made the depicting of transcendental unity into diverse face quite opposed to the ethical consideration of the limited region. But we differ from such erroneous considerations when we get a prospective view of the manifested transcendentality eliminating all historicities and allegorical enterprises. All our enjoying mood should have a different direction when we take into account the transcendental entity who has into account the transcendental entity who has obsessed all frailties and limitations of nature. So we solicit the happier mood of the scrutinizers to pay special attention to the importance of manifestive transcendence in Krsna. It was found necessary to publish this small book for the use of English-knowing people who are interested in the acme of transcendental truths in their manifestive phases. The theme delineated in the texts of this book is quite different from the ordinary heaps of poetical mundane literature, as they are confined to our limited aspiration of senses. The book was found in the South some four centuries ago and it is again brought into light in the very same country after a long time, just like the worshiping of the Goddess Ganges by the offering of her own water. 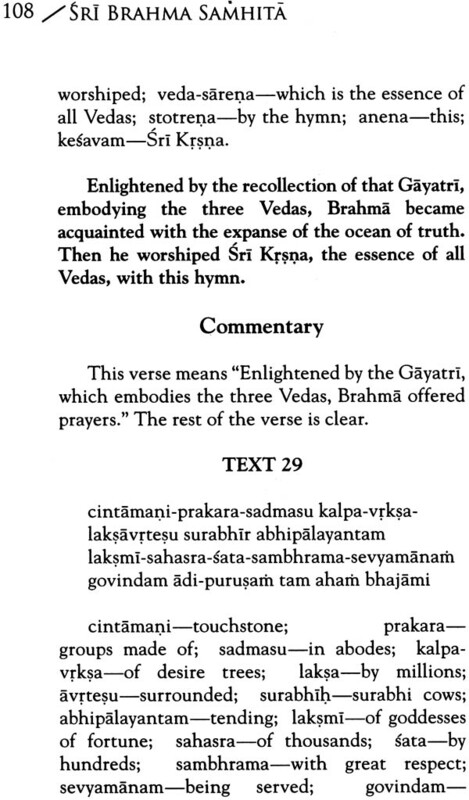 In Sri Caitanya-caritamrta, Madhya-lila, There is a nice description of how Sri Caitanya Mahaprabhu discovered the Brahma-samhita while touring South India. “Sri Caitanya Mahaprabhu and His assistant Krsnadasa arrived at the bank of the Payasvini River, where they bathed before going to see the temple of Adi-kesava. When the Lord saw the Adi-kesava temple, He was immediately overwhelmed with ecstasy. Offering obeisances and prayers, He chanted and danced. All the people there were greatly astonished to see the ecstatic pastimes of Sri Caitanya Mahaprabhu and so they received the Lord very well. “In the temple of Adi-kesava, Sri Caitanya Mahaprabhu discussed spiritual matters among highly advanced devotees. While there, He found a chapter of the Brahma-samhita. Sri Caitanya Mahaprabhu was greatly happy to find a chapter of that scripture, and symptoms of ecstatic transformation-trembling, tears, perspiration, trance and jubilation-were manifest in His body. Later in His travels, Sri Caitanya Mahaprabhu discovered the Krsna-karnamrta by Bilvamangala Thakura. These two books were considered by Him to be most valuable jewels and so He took them with Him on His return trip. 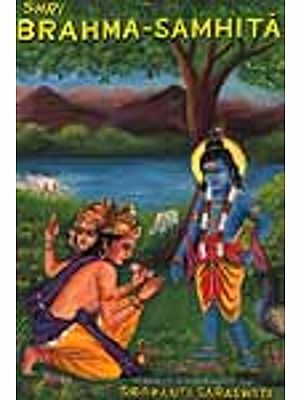 When the Lord came to Vidyanagara He vividly described His travels to Ramananda Raya and told him how He had acquired the Krsna-karnamrta and Brahmasamhita. When Sri Caitanya Mahaprabhu returned to Jagannatha Puri, He met all His devotees. While speaking to Vasudeva Datta, the Lord said, “For your sake only, I have brought tow books from South India. “The books are being kept with Svarupa Damodara, and you can get them copied.” Each and every Vaisnava copied the two books (Krsna-karnamrta and Brahma-samhita) and in due course of time they were broadcast all over India. 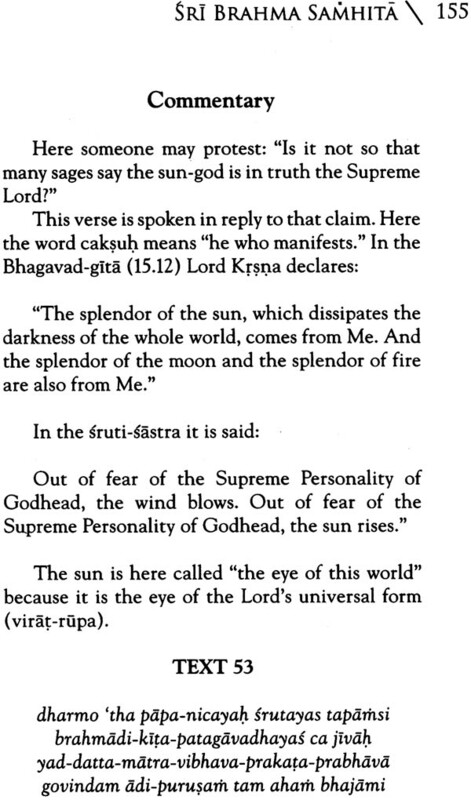 In his purports of Sri Caitanya-caritamrta, Srila Prabhupada wrote: “The Brahma-samhita is a very important scripture. Sri Caitanya Mahaprabhu acquired the Fifth Chapter from the Adi-kesava temple. 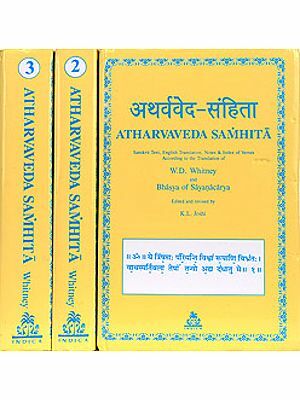 In that Fifth Chapter, the philosophical conclusion of acintya-bhedabhedatattva (simultaneous oneness and difference) is presented. The chapter also presents methods of devotional service, and the eighteen-syllable Vedic hymn, discourses on the soul, the Supersoul and fruitive activity, an explanation of Kamagayatri, kama-bija and the original Maha-Visnu, and a detailed description of the spiritual world, specifically Goloka Vrndavana. Srila Prabhupada often lectured on Brahma-samhita as he traveled around the world to his temples. While lecturing at Upsala University in Stockholm, Sweden in 1973, he said: “In this way, if you read Brahma-samhita, you’ll get complete description of the spiritual world, the spiritual entities, the Supreme Lord, His associates. His country, His pastimes, everything, very nicely described. And if we become attached to such a place, then we can try to prepare ourselves for going back to home, back to Godhead. That is the perfection of life. That is the mission of Krsna consciousness movement. 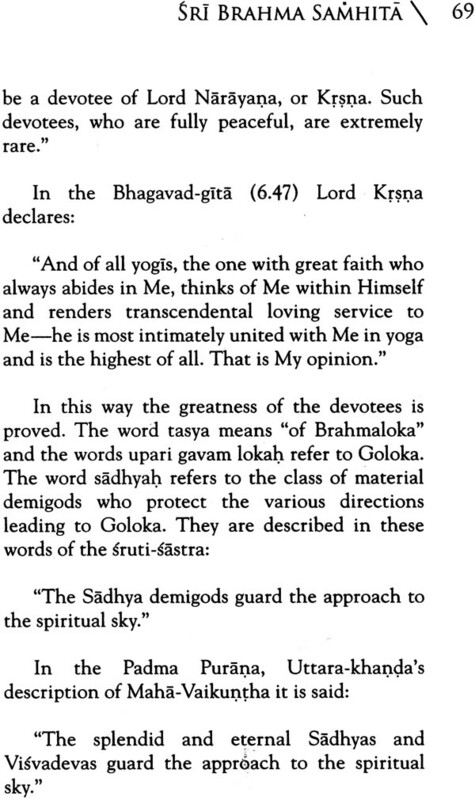 Srila Prabhupada always used the English translations of his spiritual master, Srila Bhaktisiddhanta Sarasvati Gosvami, and he even recorded his Preface, which made a very distinct impression upon all who heard it. 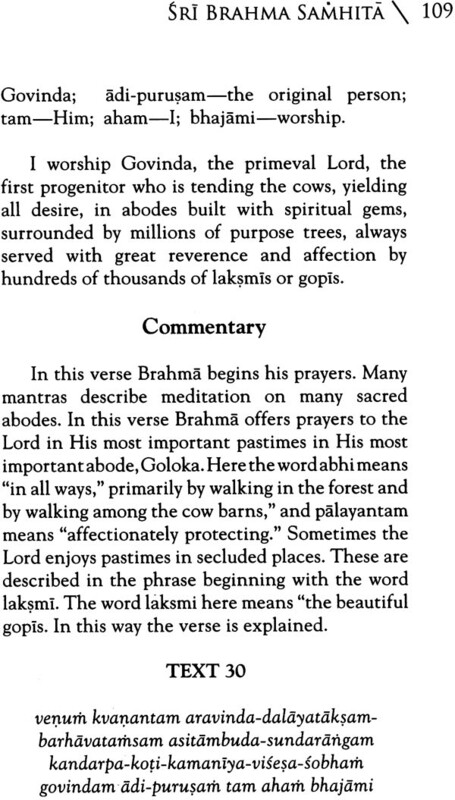 This Preface is included in this current edition, which incorporates the commentary of Srila Jiva Gosvami translated by Kusakratha Prabhu. I worship that transcendental seat, known as Svetadvipa where as loving consorts the Laksmis in their unalloyed spiritual essence practice the amorous service of the Supreme Lord Krsna as their only lover; where every tree is a transcendental purpose tree; where the soil is the purpose gem, all water is nectar, every word is a song, every gait is a dance, the flute is the favorite attendant, effulgence is full of transcendental bliss and the supreme spiritual entities are all enjoyable and tasty, where numberless milk cows always emit transcendental oceans of milk; where there ever present and without past or future and hence is not subject to the quality of passing away even for the space of half a moment. That realm is known as Goloka only to a very few self-realized souls in this world.